Security is one of the major factors every smartphone users should consider. As we know, android smartphone comes with the built-in pattern lock or security lock, but it’s difficult to find an android smartphone with an individual lock for different category of files in it. 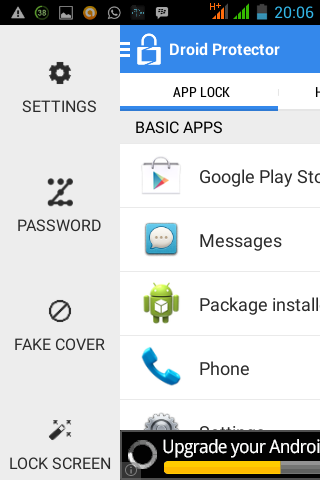 You guys might be familiar with android softwares for application lock, but today’s stroll, I would recommend a software that don’t just lock or password-protect application, but also lock other categories of files like musics, videos, social messegers (gmail, sms, facebook app, snapchat, instagram etc.) and many more. DROID PROTECTOR is a unique android app that lets you lock any document or app on your android smartphone, such as: Gmail, Facebook, SMS, Snapchat, Whatsapp, Viber, Evertone, Line etc. it also lets you lock incoming calls and special install/unistall apps. With DROID PROTECTOR, you can easily prevent your kids from trying to purchase unwanted apps, games or media from your playstore, and also prevents your friends or kids from switching your wifi or changing your smartphone setup. The DROID PROTECTOR, also lets you hide most of your vital documents and also prevent your family or friends from viewing them, it also keep it save from prying eyes. · With Droid Protector, you can view photos, videos and .gif files in it. 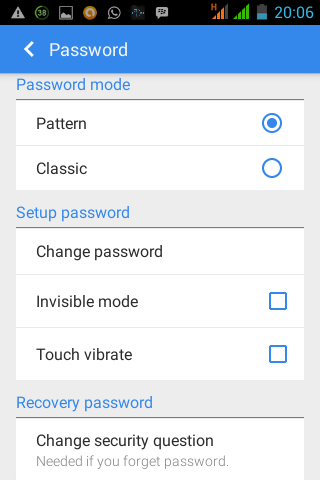 · Its password protection mode is in pattern lock, classic lock and calculator lock. · First download Droid Protector from Google playstore. · Then install and run the droid protector, once you open the app, on the screen you would notice an interface where you can easily lock most of your apps, as listed on the Droid protector. · Simply input a pattern lock mode for the apps you wish to lock and same procedures are applied if you wish to hide your photos and images. Hope this application would be very useful to most of us. It an app that I recommend for every android user, because it helps to protect most of your privacies and also keeps your files and apps save from unathorized access.